VietNamNet Bridge – A train from HCM City to Hanoi ran into a 16-seat passenger car at 3 pm, March 30, in Hanoi’s Thuong Tin district, killing seven on the spot. Two other died on the way to hospital. 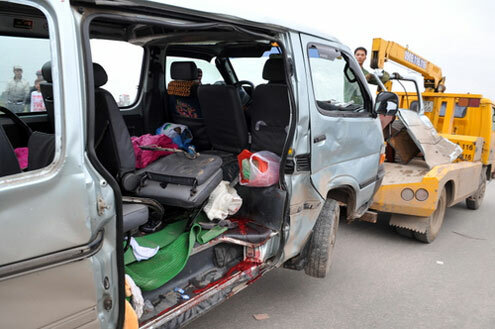 Le Van Dan, 69, who was injured in the accident, said that the car was carryinh 20 people from a wedding party in Thuong Tin back to their home in the northern province of Thai Nguyen. “When the car was only 100 meters from the railway, though the train blew its whistle and the warning equipment sounded the bell the driver still talked on the phone and crossed the railway on purpose,” Dan, who sat next to the driver, recalled. After the crash, he swooned and when he regained his senses, the man was in the Agriculture Hospital 1 in Thanh Tri district, Hanoi. Dan’s mother – Mr. Vuong Thi Hay, 97 – was seriously injured while his wife – Truong Thi Vi, 66, died on the spot. Ha Thi Thuy, another injured victim, said she and her son sat in the head of the car so they narrowly escaped death but her mother, her son and son-in-law and her nephew died in the accident. Thuy said all people in the car were her relatives. Doctors said that injured victims must be treated for at least a month. They also said that the driver was not injured. He was just in a state panic. According to police, of the seven people who died on the spot, there are two young men and five women. Two died on the way to hospital. Of 11 injured victims, some were in critical condition and they were transported to the Vietnam-Germany Hospital. Those who received minor wounds were the driver, who was arrested, a young couple and their 9-month-old son who sat in the head of the car. Some witnesses said that the passenger car intentionally crossed the tracks when the train was very near. The train hit the car bottom. The car turned a round and crashed into the handrail that separates the railway and the National Highway 1A. 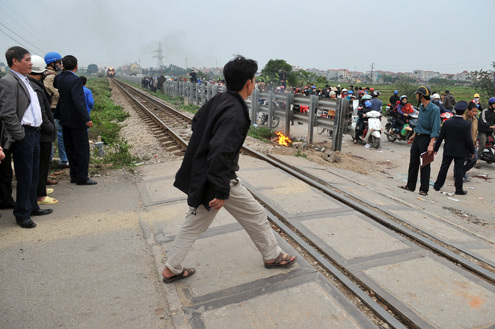 One hour after the incident, the train continued running to the Hanoi Railway Station. The deformed car was moved from the site to a police station for investigation. Pham Van Binh, representative of the Vietnam Railway Corporation, said that the train engine was not harmed because the crash was not strong. The railway between Hanoi and Nam Dinh is called “the rail of the death” because it includes hundreds of intersections with roads, where many incidents have occurred. 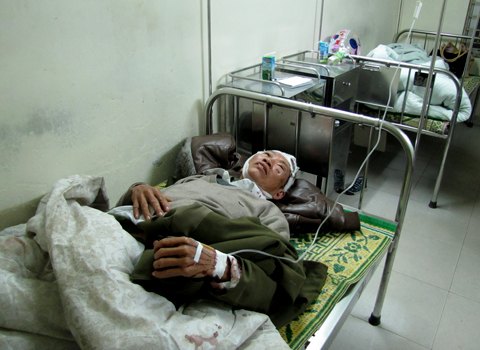 Earlier, on August 6 2010, after hitting a truck in Duy Tien district, Ha Nam province, three carriages of a North-South train was upturned. Over 300 passengers were safe but the train driver was injured. On November 22 2009, a 30-seat passenger car also crashed a North-South train also in Thuong Tin district, with nine deaths.